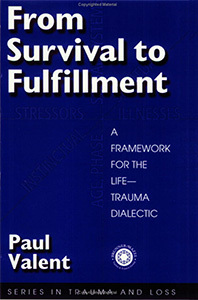 When survival or fulfilment are threatened, people manifest a great variety of responses and consequences. They range from basic instincts to the most sublime aspects of life. They include physical, psychological, and social symptoms and illnesses, and they vary according to time, place, age, and social system, as well as the particular way people tried to survive and thrive. In this book, Dr Valent forges information from many disciplines. The result is an unprecedented text on traumatology and human fulfilment. Dr Valent introduces his new ‘wholist’ theory gently, on the back of clinical and historical material, examining and extending the current concepts of stress, trauma, defences, memories, post-traumatic stress disorder, and other conditions. The result is no less than a new understanding of the human condition. It spans the life cycle and transgenerational transmission, radiation across communities and the scaffolding of human evolution, including morality, meanings, and the sacred. The theory enables understanding of many otherwise unintelligible human responses. This is done by tracing such responses along their radiations back to their sources and the contexts that evoked specific survival responses.